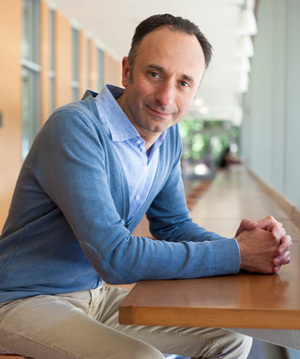 Roberto Manduchi, professor of computer engineering at UC Santa Cruz, has received funding to develop technology solutions for low vision from Research to Prevent Blindness (RPB) in partnership with Reader’s Digest Partners for Sight Foundation (RDPFS). The $100,000 grant to Manduchi is the first RPB/RDPFS Innovations in Technology Low Vision Research Award. Manduchi is developing an economical and easy-to-use screen magnifier for people with low vision. The award supports solutions for people with remaining functional vision rather than those who are totally blind, with a focus on mobile and wearable innovations that can be implemented on multiple platforms, such as electronic tablets or phones. Manduchi's project will use an eye-tracking system to control screen magnification, so that the part of the display that is magnified is determined by where the viewer is looking, rather than by using a mouse or trackpad. He said the use of “gaze-dependent displays” is not a new idea, but these systems tend to be expensive and require special hardware. Low vision refers to chronic impairment that is not correctable by eyeglasses, medicines, or surgery. Many eye disorders can lead to low vision, including age-related macular degeneration, glaucoma, and diabetic retinopathy. Injury to the eye or to a portion of the brain involved in sight can also produce low vision. Low vision significantly and negatively impacts a person’s visual activities of daily living and quality of life. The National Eye Institute estimated that 3 million U.S. persons suffered low vision in 2010, with projections that this number would increase to nearly 5 million in 2030 and 9 million in 2050. Research to Prevent Blindness, in partnership with the Lions Clubs International Foundation and Reader’s Digest Partners for Sight Foundation, announced the first grantees in its $1.2 million, two-pronged research initiative to address urgent needs in understanding and treating low vision on June 10. Separate awards will fund researchers working on ways to improve the brain’s ability to take information from a compromised visual system and create vision, and on technology solutions to make daily tasks easier for those with vision loss.